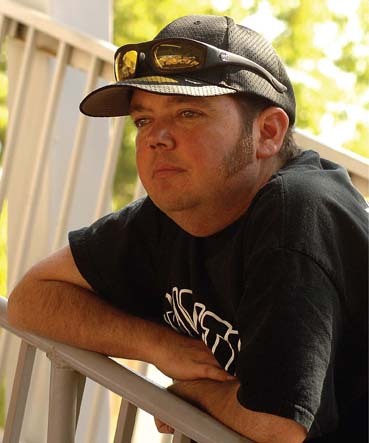 Jamie Booth with his original TRF Egress, restored by Daniel Rowlands. 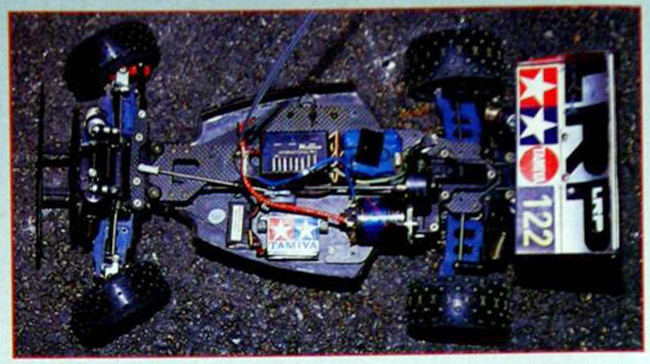 The Tamiya Egress was released in 1989 and was an evolution of Fumito Takis Avante chassis, that was released a year earlier. By removing some of the weakest points of the Avante, like the over-engineered suspension linkage system and the relatively short wheel base, the Egress was more competitive and durable than its predecessor. But even with these enhancements, the buggy still had its flaws, and the redesigned suspension couldn’t hold up to the simpler and more sturdy double wishbone systems of the Kyoshos, Schumachers and the Yokomos. The newly designed blueish “Hi-cap” shock absorbers of the Egress are however considered among the best shocks of the vintage era, and they are just as beautiful as, and even more expensive today than the famous Kyosho gold shocks. 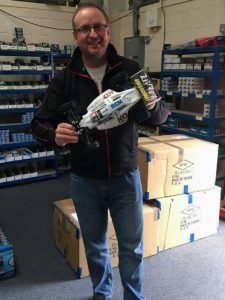 In one of the first ever Tamiya Racing Factory (TRF) operations, an effort was made in 1990 to bring the Tamiya buggies up to the standards of its competitors. This first TRF-car, now known to the public as the “Jamie Booth Egress” or “TRF Egress” was a major overhaul, converting the still rather complex and odd suspension setup to the now more “standardized” double wishbone system of the competition. 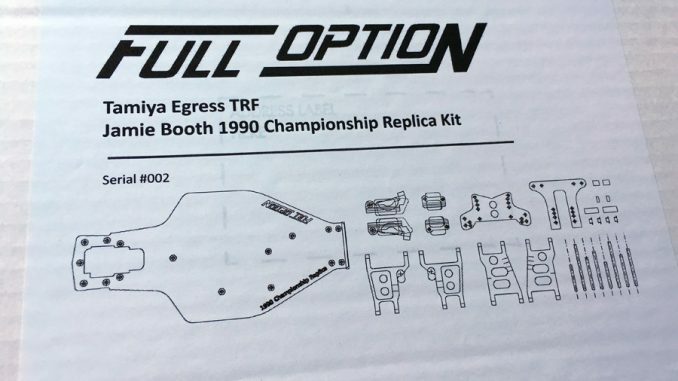 The TRF Egress, that sported an even longer wheel base than the original Egress and some very complex machined aluminum parts, was a one-off and never available to the public. 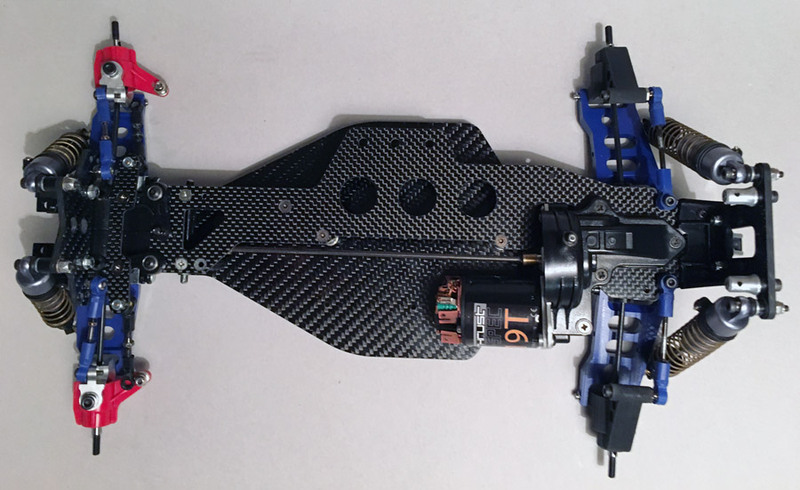 This prototype worked as a development platform for Tamiyas Top Force buggy, and not until 2015/2016 should it be possible for others to build and drive this mythical creature, although with the standard Egress wheel base (Jamie Booth and TRF experimented with both standard and longer wheel bases). I have in my possession kit #002 of the 17 numbered “Jamie Booth Egress” kits made by Dave Beeby of Full Option in the UK, a research/development/production operation that took almost a year to realize. #001 is the prototype for the replica kit, owned and driven by Jonathan J. Cryer, so my kit is actually the first production kit. The NIB kit, as it came from Dave and Full Option. The original car was driven by the legendary Jamie Booth in the 1990 British National Championship races. The replica kit was made on a pre-order basis, with orders and payments taken in September 2015, and delivered in March 2016. The kit consists of everything needed to convert a standard Egress (original or re-release) to the TRF spec Egress of Jamie Booth. 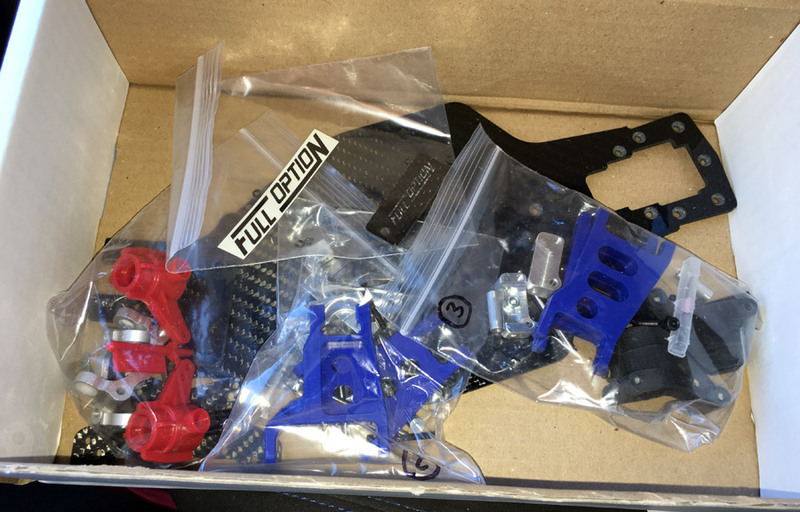 The conversion comes with a carbon chassis, CNC’d delrin suspension arms and aluminum suspension arm mounts, as well as a lot of other bits and pieces, all nicely packed in a box. One of the few photos of Jamie Booths original TRF Egress. I have assembled the kit, and in addition to the supplied parts I’ve used a pair of re-released gearboxes, diffs and universal shafts. Some of the bolts and nuts are from a vintage Egress, but those will be changed for hex screws all around. I just didn’t have hex screws in all the variations needed. The upper link tie rods are from various sources, as I was just using whatever I had at hand. Those will also be changed. The upper carbon deck is from Fibre-Lyte. The hi-cap shocks are original ones from a vintage Egress. The steering is a re-released ball bearing racing steering set for the Avante, that I found in my Avante/Egress box. I encountered a couple of minor problems when assembling the kit, as a few of the supplied screws were of very bad quality. One head was stripped out of the box, and another one didn’t have a hex hole at all. It was completely filled. The supplied carbon chassis also had a flaw, as one of the holes for the top deck supports (the left one of the two in the middle of the picture below) were off by almost a centimeter. I also had some trouble fitting one of the front aluminum parts that the A-arm mounts to, and I had to modify it a little. Other than that the build was rather straightforward. The build involved cutting a few of the original pieces, and I also had to drill out the holes in the top deck where the rear upper links are attached (a dremel tool for this purpose was supplied with the kit!). I’ve yet to decide on body, wheels and tires, but that will have to wait, as I have a few other projects going at the moment. Yes, this was the test platform for the Top Force!